Adam Keefe claimed the Belfast Giants had too many passengers on their roster as they fell to back-to-back defeats in a 6-4 reverse at the Dundee Stars in the Elite League. Despite the consecutive losses, the Giants still lead the league. However, the chasing Cardiff Devils are only a point behind with a game in hand, and they come to Belfast on Sunday. It was not a good night defensively for the Giants, who were missing starting netminder Tyler Beskorowany, but not even he could have done much to stop Stars forward Francois Bouchard scoring a hat-trick of two-on-one opportunities. 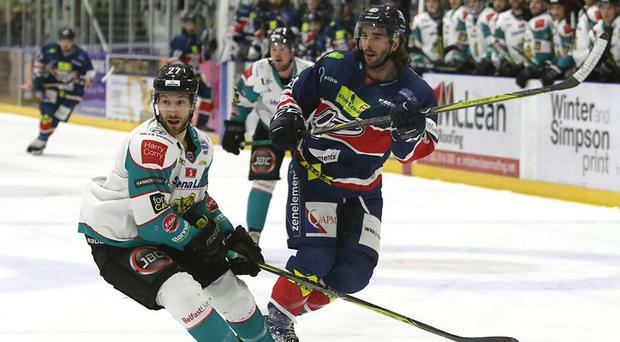 And once again it seemed like the Giants suffered from having played a mammoth 15 games on the road coming into this clash as they conceded three times in the third period, which eventually led to the defeat. "Not good enough," was the assessment of head coach Keefe. "The only positive that can come out of tonight is I now know who can and can't play in certain situations and where to go with the line-up from here. "We know we're good, but we wanted to come in here and play with a fuller line-up to conserve bodies and it didn't work, so it's back to the drawing board. "Way too many passengers out there and we didn't get the job done. We turned it on late in the third period but it was too little too late." It was the Giants who took the lead on a delayed penalty call, Blair Riley passing to the backdoor for Jonathan Ferland to finish at 6:54. The lead was short-lived, Stars defenceman Shawn Boutin scooping in a rather scrappy rebound off Murphy's pads from Lukas Lundvald's shot at 7:47 to level the game at 1-1. The best chance of the remainder of the first period fell to Stars ace Fabrizio Ricci on a five-on-three powerplay, the forward unable to jam the puck home at the crease as the Giants made an important kill. But the hosts didn't have to wait long to gain the lead and it was Bouchard who grabbed his first, going on the two-on-one with Corcoran and finishing past Murphy at 22:30 early in the second period. Scoring short-handed against the Stars has become something of a forte for the Giants recently - they had two in the 8-0 blowout a week ago - and Dustin Johner's leveller also came a man down. The centre did extremely well to beat Connor Cox to the puck after his own stick-check, and the finish past Pontus Sjogren in the Dundee net was even nicer to level at 28:04. And it was the same man who put the Giants ahead at 32:30, this time on the powerplay, as the puck fell nicely to him at the backdoor for the finish. They nearly had a fourth on another powerplay opportunity when a scrambling d-man cleared the puck off the line, and when it went the other way, Bouchard was there. This time it was Lundvald with the pass across the crease at 37:43, but the Canadian was no less lethal with the finish. The Giants could, and maybe should, have led at the second intermission when Rutherford fanned on a shot with seconds remaining and he was made to pay by Brian Hart, whose crisp finish from the slot at 45:10 put the Stars ahead in the third. Just 51 seconds later, Dundee had a fifth, this time Matt Marquardt deflecting the puck in on the doorstep. Perhaps the Giants' best chance at making the game a contest came and went when Josh Roach somehow missed a gaping net when set up by Kendall McFaull at the backdoor, and when Bouchard completed his hat-trick of two-on-ones at 50:15, the game was gone. Riley did at least make it interesting with 4:10 remaining when he squeezed the puck under the sprawling Sjogren but, like his goal in Sheffield on Sunday, it was too little too late. Jim Vandermeer appealed desperately for Francis Beauvillier's late finish to count on the scoreboard, but the referees eventually ruled that it did not come before the buzzer, not that it mattered in the end.